Scientists from three different institutions are about to publish the blueprint for a nuclear clock more accurate than anything ever created before. The proposed clock will use from the nucleus of a single thorium ion to achieve the unparalleled and mind boggling accuracy of a tenth of a second over 14 billion years – the age of our universe. Developing the most accurate nuclear clock ever envisioned is the goal of research being reported in the journal Physical Review Letters by scientists from Georgia Tech, the School of Physics at the University of New South Wales (Australia) and at the Department of Physics at the University of Nevada. Atomic clocks have been around since the late 1940s and grown more and more accurate ever since. In recent years quantum logic clocks based on individual ions of magnesium and aluminium have been shown to be accurate for about a second over 2 billion years. Atomic clocks have all types of uses ranging from making the Global Positioning System (GPS) most of us use on a daily basis function accurately to keeping worldwide clocks accurate for anything ranging for stock exchange transactions to secure communications. Although not all current atomic clock applications require such extreme accuracy, scientists do believe that some existing (and possibly more future) applications such as secure communication and certain fundamental physical theories could benefit from such a clock. 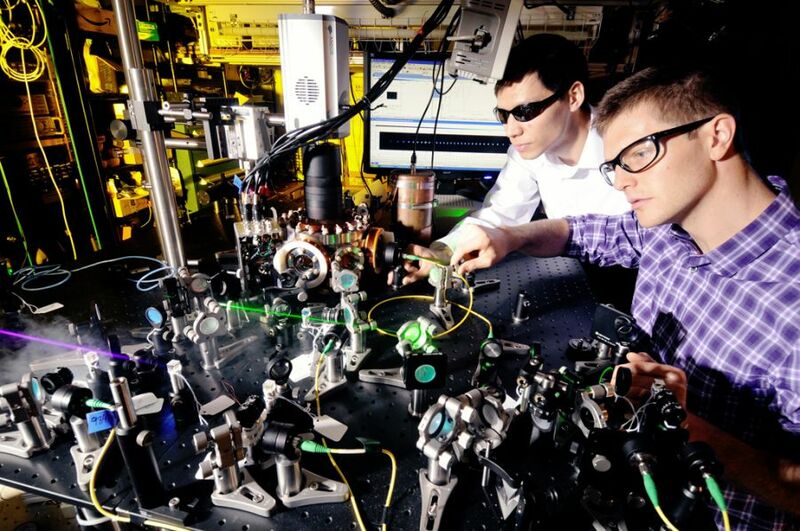 Atomic clocks gain their accuracy from laser-induced oscillations of electrons in atoms. The problem – electrons can be affected by magnetic and electrical fields, which cause even precise atomic clocks to lose their accuracy slightly over long starches of time (long being about 4 seconds during the lifetime of the universe). Since neutrons are much heavier than electrons and densely packed into the atomic nucleus, they are less sensitive to these problems than the electrons. According to Professor Corey Campbell from Georgia Tech and the current paper first author: "we showed that by using lasers to orient the electrons in a very specific way, we can use the neutron of an atomic nucleus as the clock pendulum. Because the neutron is held so tightly to the nucleus, its oscillation rate is almost completely unaffected by any external perturbations." The researchers are planning to create the oscillations using a laser operating at petahertz frequencies or 10^15 oscillations per second in order to boost the nucleus of a thorium 229 ion into a higher energy state. The clock will need to be maintained at a very low temperature – just about absolute zero to keep it from moving. Typically laser is used for such extreme cooling purposes but because laser light is also used to create the timekeeping oscillations this might pose a problem. To resolve this problem, the researchers plan to include a single thorium 232 ion with the thorium 229 ion that will be used for timekeeping. The heavier ion will be affected by a different wavelength than the thorium 229 and cool the heavier ion without affecting the oscillations. Although there are still challenges including the exact frequency of laser emissions needed to excite the thorium nucleus (which has eluded scientists for the past 30 years), the researchers are optimistic that a solution will eventually enable them to build the thorium clock which will enable about two orders of magnitude increase in timekeeping accuracy. More information on the Thorium clock can be found on the Georgia Tech website.